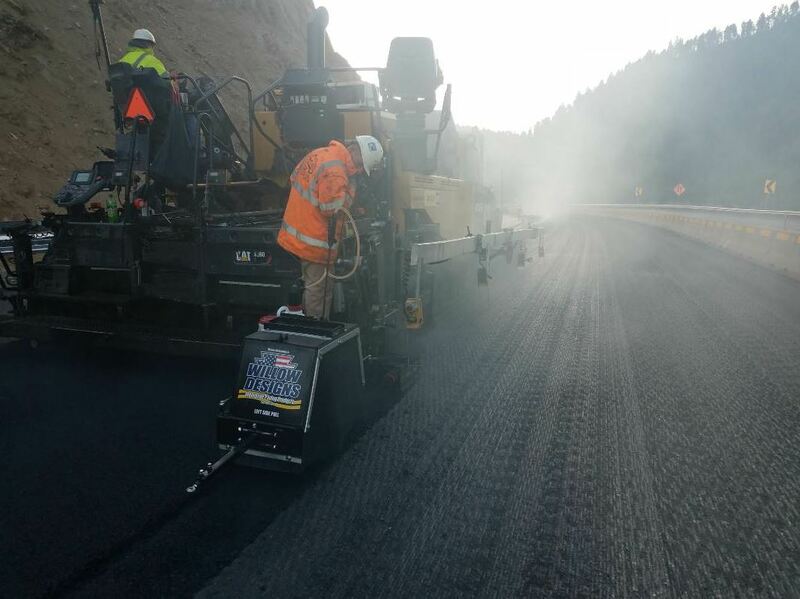 This 8-mile job on Interstate 15 near Boulder, between Helena and Butte, Montana, was one of the first jobs Schellinger Construction completed using Willow Designs’ notch wedge joint apparatus and pneumatic roller system. It isn’t much of a stretch to say that Schellinger Construction, Columbia Falls, Montana, never uses the same mix twice. Of course they do, but the general contractor’s paving crews are almost always on the move, transporting the company’s Astec 400 ton-per-hour double barrel and CMI E3 400 asphalt plant to jobs all around central and western Montana. One constant, however, is the need to properly compact notch wedge joints. 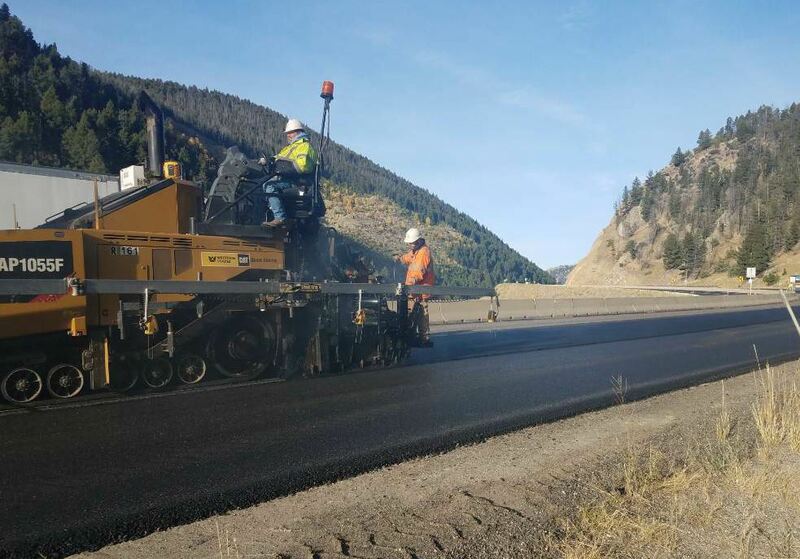 “Around 80 to 90 percent of our jobs are for the Montana Department of Transportation,” said Schellinger’s Manager of Asphalt Operations Bob Warren. That’s why Schellinger purchased a notched wedge joint and pneumatic roller system from Willow Designs, East Berlin, Pa. Specifications for gently sloping safety edges, also known as notch wedge joints, have become common across North America. Montana’s Department of Transportation requires notch wedge joints on its projects, and began offering a pay factor related to joint compaction over the last few years, Warren said. Schellinger Construction purchased the notch wedge joint apparatus from Willow Designs in 2017. In 2018, the company added Willow’s pneumatic roller, seen here, behind it. The results of his homemade device were also a bit more hit or miss, Warren added. Warren began looking for a more reliable solution. “I asked around and found that a lot of my competitors were using Willow’s device,” he said. Last year, the company purchased the notch wedge joint apparatus. This year, they tacked the pneumatic roller, which they call R2D2 for the way it wobbles along behind the paver, behind the notch wedge joint apparatus to ensure proper compaction of the joint. So far, Schellinger’s crew has used the notch wedge joint device on about a dozen jobs, and its new pneumatic roller on two. In September and October of 2018, the crew used the entire system on an 8-mile job on Interstate 15 near Boulder, between Helena and Butte, Montana. Schellinger Construction was selected as the low bidder on the $8.5 million project, which included milling and replacing 2.4 inches of asphalt across 16 lane miles. The job required a total of 36,000 tons of hot-mix asphalt. The crew had to contend with many curves and 10 bridges where the interstate passes over the Boulder River. “That’s more than 60 bridge connections,” Warren said. Warren estimates that 80 to 90 percent of Schellinger Construction’s jobs are for the Montana Department of Transportation. Other challenges included having one lift with which to achieve a smooth ride, on top of a 2.4-inch milled (rather than profile milled) surface, no less. There were also the challenges of varying conditions along the road, such as intermittent sunshine, and the properties of PG 70-28 ¾-inch asphalt. Schellinger earned bonuses for rideability, volumetrics and density on the Boulder job. They even made a small bonus on joint density. Warren estimates that the crew hit the joint density spec 80 to 85 percent of the time, compared to 70 to 75 percent of the time before they began using the pneumatic roller. “It definitely improved our compaction on the Boulder project and left behind a better looking mat on the surface of the wedge,” Warren said. The other job it used the entire system on was a $12 million job west of Missoula, using PG 64-28 half-inch mix. On that job, Warren said, the joint density was a bit more hit-or-miss. On the first job with the pneumatic roller, Willow Designs’ proprietor, Jerod Willow, came to Schellinger’s job site to provide guidance on the system. Specifications for gently sloping safety edges, also known as notch wedge joints, have become common across North America. Montana’s Department of Transportation requires notch wedge joints on its projects. Results were already improving by their second job with the system. Willow offered a number of tips, many of which are available in the sidebar of this article. 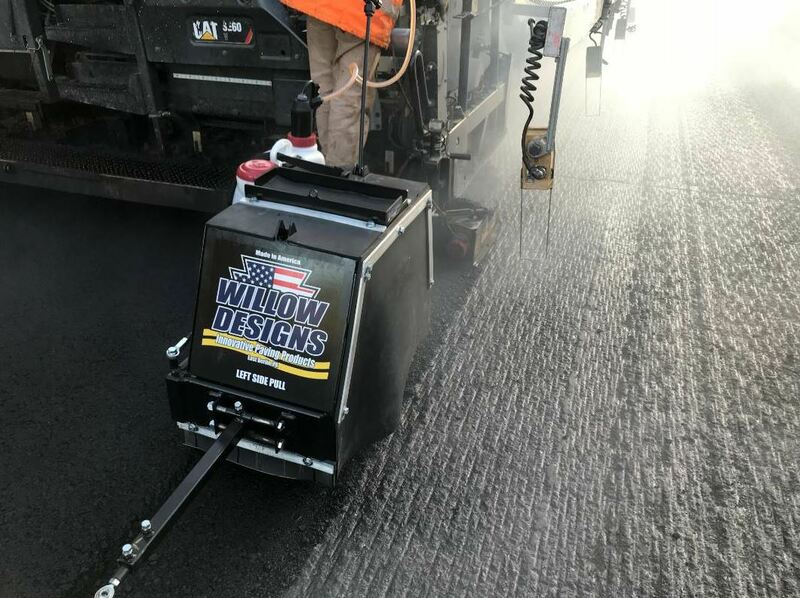 Clients who purchase a notch wedge pneumatic roller get one shift of support anywhere in the united States or Canada from Jerod Willow, who has more than 23 years of experience in asphalt laydown and 16 years of knowledge using notch wedge joints. For example, Willow recommends using a double application of tack to really keep the joint together, assist in filling the voids of any minor segregation in the wedge, and aid in joint density. He also recommends staying 12 to 15 inches to the inside of the joint on the first roller pass to help stabilize the material over the notch wedge joint, and then compact the section skipped on the first pass during the second pass. Although the unique challenges that come with Schellinger’s portable asphalt operations will always be there–with or without a notch wedge joint system–Warren is keen to improve consistencies wherever he can and the crew is rapidly closing in on any learning curve surrounding how to use Willow’s notch wedge joint and pneumatic roller system. Jared Willow, proprietor of Willow Designs, shares his top tips for making notch wedge joints with Willow Designs’ system. Willow recommends that the depth of the notch be between 35 and 50 percent of the compacted mat, with 40 percent being ideal. When dialing in the depth of the notch, he warns to compensate for the compaction depth of the mat, and to check the notch’s depth after the first roller finishes its compaction pattern. Willow recommends a double application of tack, “if using anything other than PG tack codes” like Pennsylvania’s specs. He suggests spraying the vertical edge of the notch wedge and the entire 12-inch wedge. To properly compact your notch wedge, placed at an appropriate depth, Willow recommends using the notch wedge pneumatic roller. The pneumatic roller has a patent-pending steering system, which allows for lateral adjustment of the pneumatic roller tracks behind the paver. It assists with the stabilization of the 12-inch wedge. The “fluff in the joint” can be eliminated by adjusting the steering system on the pneumatic roller to cut the mainline mat by 1/2 an inch to 1 1/2 inches to create a new vertical edge for the notch. Willow said this will yield higher density numbers on the open edge of the joint prior to placing the second pass or adjacent lane. Then, he said, continue rolling the rest of the mat as normal. Whether paving the second pass or an adjacent lane, Willow said it’s critical to overlap while matching the joint. “You don’t want an open joint, but you also don’t want too much overlap,” he added. The overlap should be between 1/2 an inch to 2 inches, based on the HMA mix and depth. A trick he uses when matching the joint on a notch wedge joint is to check the mat depth 15 inches from the joint. “If this area is short on HMA mix depth, increase the main screed depth while adding a little positive slope on the joint matching extension so the joint will still roll in during compaction,” Willow said. 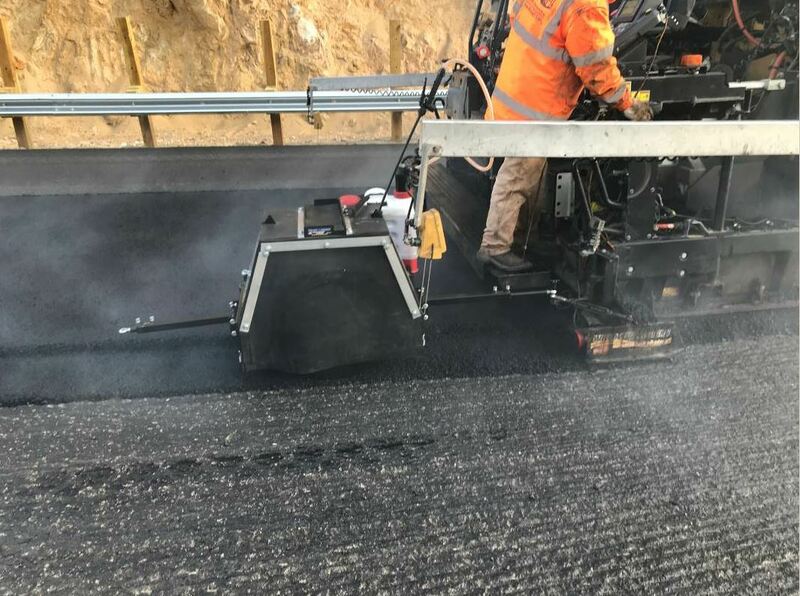 “This minor adjustment will still provide a flat profile of the finish pavement on the second adjacent pass after compaction, but will provide more material in the joint to get density. It’s imperative to use a green release agent prior to paving, one that is not cut with water. Once the pneumatic tire is heated up, reapplication of release agent should be every 15 to 45 minutes, depending on the mix being placed.